An example of a one month long record of stage (water level) and discharge (water flow) from a salt marsh creek is shown in the figure. There is clearly some complex structure in this relationship. It varies over time as the tides run through their spring-neap cycle. But there seems to be a pattern in the way the discharge bends as the tide rises and falls. This behavior reflects the flow processes going on in the marsh. How, exactly, is the geometry of this time series generated? Can we exploit the geometric properties of the stage-discharge relationship to learn something about the way water flows through the marsh? How do the geometric properties of the stage-discharge relationship influence the transport of nutrients and sediment through the marsh? 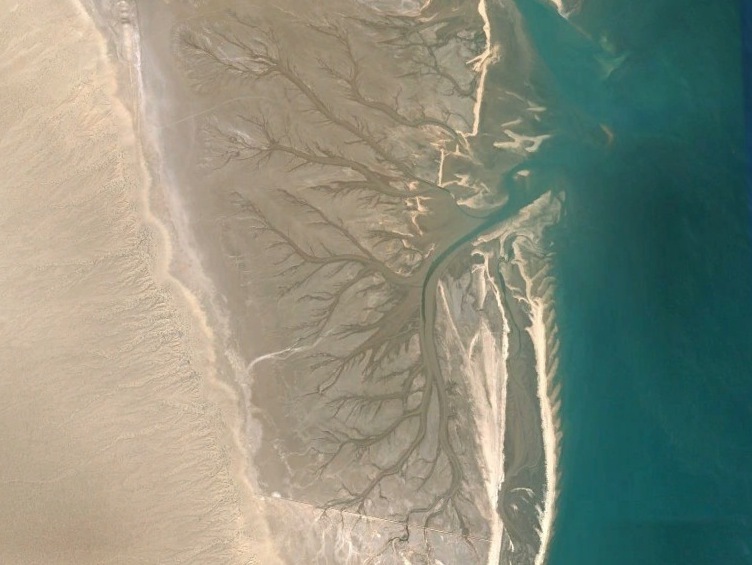 Lining both coasts of the Gulf of California are hypersaline lagoons called esteros. These esteros harbor salt-marsh-like ecosystems, but in some of them, the water is so salty that vegetation cannot grow on the surface of the marsh. We showed in Kearney and Fagherazzi (2016) that these unvegetated marsh platforms have very different channel networks than vegetated marshes. The estero channel networks are more heavily branched, and their channels are straighter than those of vegetated salt marshes. We believe that this difference is generated by the lack of vegetation which otherwise would support the marsh banks and allow meandering channels to develop. How does the unique network geometry change the way water transports nutrients and sediment into the estero, and what does this mean for the biological structure of the estero?